Potsdam’s Danner Dorthy (4) slashes the bouncing shot on net, but it was picked up by Canton goaltender Rhett Palmer who was making his debut in net with three saves. 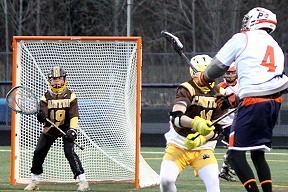 Knight and Colin Taylor had single scores, while Cayden Emerson chipped in two assists for the Bears. 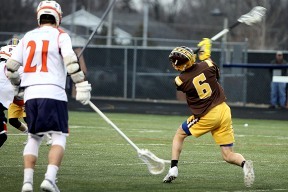 Keenan Hassett scored two goals, while Zach Kirka notched the other. Dorothy had an assist. Potsdam goalie Nate Green made 11 saves. 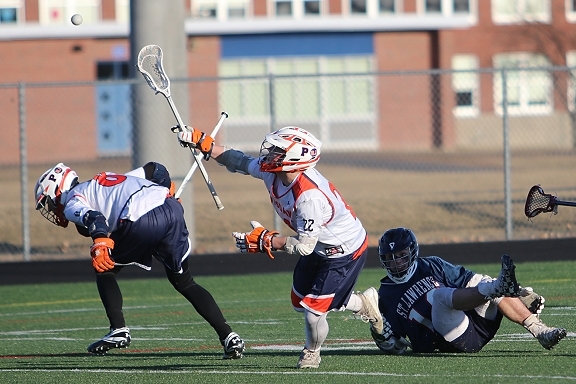 St. Lawrence Central's Sean Hornung (22) looks for an opening on attack in front of Potsdam goalkeeper Nate Green (1). SLC's Jayden Ashley pumped in four goals, while Ryan LaPage added two markers, and both Alex Burg and Zack Dumers scored single goals in the Larries' road win. Goalie Cash Feeley registered 13 saves, with six in the first quarter alone. 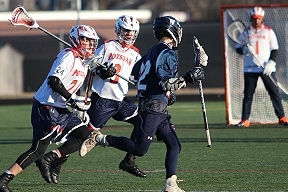 For Potsdam, Keenan Hassett led the way with two goals and an assist, while Will Varney and Drew Talcott each had one score. Green made 11 saves for Potsdam.